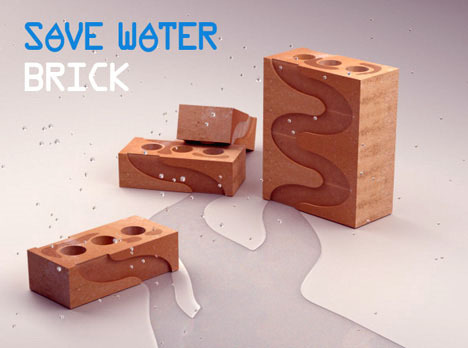 How many innovations have ever been made to the common red brick? There was the person who decided to add texture to their surface, and maybe the composition of the brick’s materials have changed over the years, but it’s essentially stayed the same for ages. 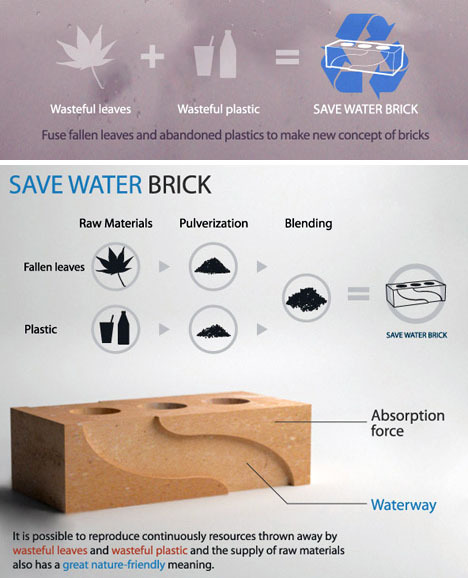 Designers Jin-young Yoon and Jeongwoong Kwon want to introduce a radical new approach to brick-making: use recycled materials and employ their design in saving rain water. Their Save Water Brick design was a finalist in the Incheon International Design Award competition 2009, the theme of which was “Green Design and Daily Life.” The designers took three ubiquitous parts of our daily lives and smashed them lovingly together: building bricks, fallen leaves, and discarded plastic. Their brick would be made of the latter two, thereby solving two pollution problems at once. The bricks also feature a waterway on the side, a sort of rainwater channel that would direct falling water to a rain barrel for collection or to an underground collection chamber. The water could then either be used directly for plants or other grey-water applications, or even purified for human consumption. 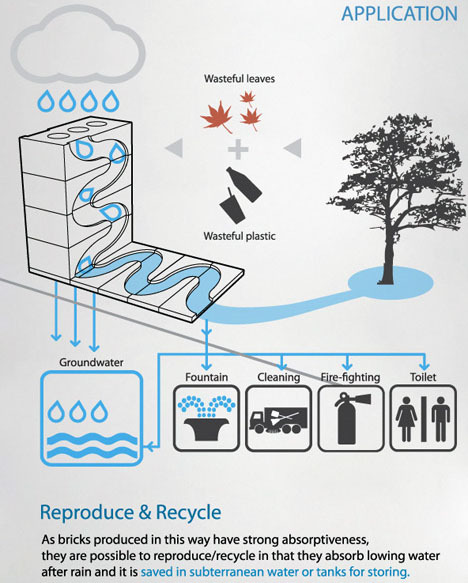 In this way, the bricks would be taking several otherwise-wasted materials and putting them all to good use: leaves, plastics and rainwater. See more in New Materials or under Science. December, 2009.